Ex-Wonthaggi and Gippsland Under-18s, the tiny Blair confounded perennial critiocs that said he was too small to make it. The nephew of John Blair, his grandfather on his mother’s side was John O’Mahoney. 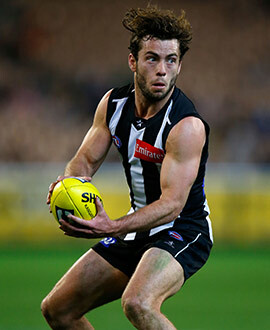 He won the Morrish Medal in the TAC Cup in 2008. Blessed with a good step that could get him out of traffic, Blair constantly impressed in the VFL in 2009 without getting a senior chance. His ability to win his own ball earned a senior spot in 2010 and he was part of the premiership side. He admitted later that six months earlier, he had thought he would miss out again and hoped to do well enough in the VFL for the Magpies to keep him on the books. He developed a defensive mindset which meant he could also take on wider roles.